Stephen F. Austin State University senior Bailey Freeman of Lufkin received the Olds Family Outstanding Student Teacher Award, which honors an exemplary student teacher from SFA's Department of Elementary Education each semester. NACOGDOCHES, Texas - Stephen F. Austin State University senior Bailey Freeman of Lufkin received the Olds Family Outstanding Student Teacher Award, which honors an exemplary student teacher each semester from SFA's Department of Elementary Education. University field supervisor MaryAnn Bentley nominated Freeman for this honor, and a committee of five SFA elementary education faculty members, who reviewed teaching videos and additional materials, selected her to receive the award. 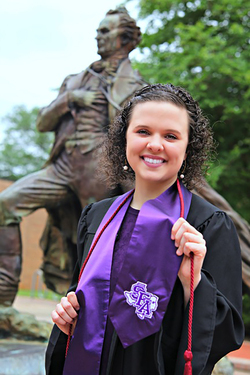 Freeman will graduate SFA this month with a bachelor's in interdisciplinary studies. Her specialization is teaching fourth through eighth grade. She completed her student teaching at Central Heights Middle School in the Central Heights Independent School District with seventh-grade teacher Brenda Trantham serving as her mentor.